RIAA Takes on AllofMP3.com for 1.65 Trillion! It appears the Russian AllofMP3.com has been handed a hefty lawsuit by the RIAA "on behalf of EMI, Sony BMG, Universal Music, and Warner Music." The lawsuit somehow justifies a cost of 150,000 per song downloaded from the site since October 2006. 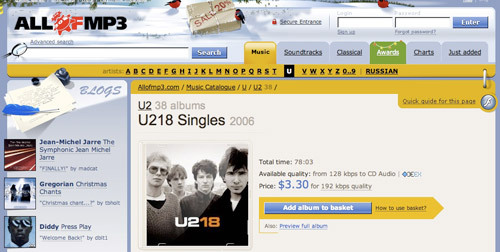 AllofMP3 carries something like 11 million songs so CyberNetNews calculates that out to roughly 1.65 trillion. AllofMP3 has attempted to be a legitimate music downloading site, which apparently it is according to Russian regulations, however there was definitely something fishy about selling full albums for around 3. AllofMP3 doesn't pay royalties to artists and is illegal in other countries for this. Perhaps this lawsuit will actually be the end of AllofMP3.com... but then again the RIAA tried to take down The Pirate Bay and it's still up. Personally I think the 1.65 trillion is just a number to scare AllofMP3 and the case will likely be settled out of court for much less. Consider typical RIAA cases against pirates. A friend of mine was sued by the RIAA for 3 songs at ~3,500 each and he ended up settling for something less than 4000 total. Just as a reminder, I do not support piracy.